​Disease and anthropogenic factors alike threaten to wipe these bovids and their curious noses off the face of the earth. Female Saiga antelope from the Russian steppe lands in Kalmykia. The saiga antelope (Saiga tatarica), a critically endangered antelope species originally inhabiting vast areas in the Eurasian steppe zone, today has a greatly reduced habitat in the region. The antelopes are about 61 to 81 centimeters tall at the shoulders, and weigh around 26 to 69 kilograms. 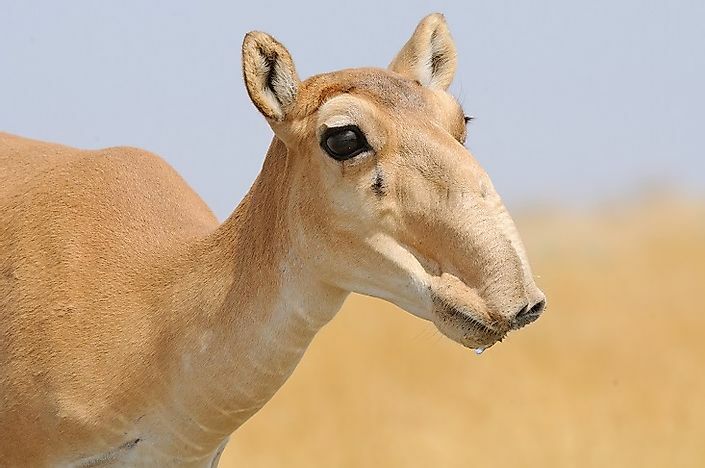 The most unique feature of the saiga antelopes are their noses, in which the bloated nostrils are closely spaced together and directed downward. These uniquely designed noses of the saiga help in breathing in clean air during warm, dusty summers, and in the wintertime it helps breathe in warm air, keeping the animal warm. They also have 7 to 12 centimeter-long ears, and dark patches on their cheeks and noses. The coat of the saiga antelope is sparse and cinnamon-colored in summer, while in winter it turns into a thick, pale, grayish white-colored coat. Only males of this species adorn the thick, wax-colored, slightly translucent horns. The average lifespan of the antelopes is around 6 to 10 years, and they have a typical gestation period of between 140 and 150 days. Though the saiga antelope inhabited a range that stretched from the British Isles all the way through Central Asia and into what are now Canada’s Northwest and Yukon territories during the last glacial age, at the start of the 18th Century their territory was greatly reduced to a much smaller stretch in Eurasia. In the 1920s, their populations suffered a major setback, which again recovered in the 1950s when 2 million saiga antelopes were found in the steppes of the Union of Soviet Socialist Republics (USSR). The demise of the USSR witnessed the large scale loss of these antelopes as well, and today nearly 95% of the antelopes have been lost and only 50,000 of them survive. The saiga antelopes now inhabit small stretches of land in the Russian Federation's Republic of Kalmykia, two areas in Mongolia, and three areas in Kazakhstan, with a small population also seen surviving in the pre-Caspian region of Russia. The Mongolian subspecies (Saiga tatarica mongolica) of the saiga antelope is the one most at risk, with a population of only around 750. In 2015, a shocking discovery was made when researchers went to the field to study the saiga antelopes in their calving season in mid-May of 2015. Within 2 days of their arrival, they noticed the death of 60% of the saigas in the herd they were studying, and soon the entire herd died off. Similar incidents were also reported in other saiga populations. Such mass die-offs of these saiga antelopes was a massive blow to the conservation efforts meant to save the already heavily threatened saiga. After collecting tissue samples from the dead saiga antelopes, scientists detected the presence of pasteurella bacterium which they believed could be responsible for the death of these animals. However, this bacteria has never before been considered to be so deadly as being able to kill so many large organisms in such a short span of time. Scientists thus believe that there is an even more sinister cause behind the saiga deaths which has yet to be discovered. Some scientists claim that the saiga antelopes could be suffering from ruminal tymphany, the symptoms of which have been detected in the dead antelopes. A team of scientists from the Royal Veterinary College in London, led by Dr. Richard A. Kock, have also claimed that climate change could be one of the culprits responsible for the large-scale saiga antelope deaths, as the influence of changing weather conditions could have transformed the harmless bacteria within the saiga into more lethal forms. However, as of yet, no definitive cause of the saiga deaths have been determined. Though currently the deadly diseases are the worst immediate threats to the survival of the saiga antelopes, in the past a number of human activities have been responsible for the drastic decline of these unique creatures. The destruction of vast tracts of the saiga habitats to make space for human settlements and livestock grazing had greatly shrunk the population of these animals. Also, competition with the local livestock for food had subjected the saiga to extreme stress as well. After the breakup of the USSR in the early 1990s, the saiga antelopes were hunted down indiscriminately. The males were especially hunted for their horns, which were used in preparing Chinese traditional medicine, while the saiga were also hunted for their meat by the impoverished local population. Conservation efforts have been stepped up since the 1990s to protect and conserve the saiga antelopes. The Cherny Zemli Nature Reserve was set up in the Kalmykia Republic of Russia in the 1990s to protect the saiga habitats. 2010 was declared as the “Year of the Saiga” in Kalmykia. The saiga population in Kazakhstan also exhibited an increase from 21,000 at the beginning of the 21st Century to 81,000 in January of 2010. However, two massive outbreaks of disease, one in May of 2010 and another in May of 2015, have once again rapidly caused the saiga populations to plummet, necessitating a fresh batch of conservation efforts to save the saiga antelopes from the brink of extinction.